The volcanic archipelagos of Cape Verde, Madeira, and the Azores – all former Portuguese colonies or current Portuguese autonomous regions located in the Atlantic Ocean – have historically seemed remote in terms of their geography, but also unreachable when it comes to early recordings. Although there is some scientific disagreement, it appears that all three of these island chains were uninhabited before the Portuguese began stopping by and subsequently claiming and inhabiting them in the 1400s. While there is an indelible musical link between the music of the islands and the music of Portugal, as islands located between continents, their music has also been influenced from centuries of connectivity with sailors and people of other cultures (in terms of Cape Verde, for example, African slaves), thus giving their music a particular uniqueness. Madeira, on the other hand, fared the worst. Paul Vernon has noted that in the 1950s, Decca issued some 33rpm EPs featuring Madeiran folk music, therefore it’s possible that 78s do exist, but he hadn’t documented any, nor have I. There were some commercial pop discs by Portuguese band leaders where songs were credited as being Madeiran, but in fact are simply pop songs. Now, to the Azores. Throughout the 20th century, due to varying economic problems, Azoreans immigrated to North America, primarily settling in coastal New England towns, but also places like Toronto and Alameda County, California. In 1919, there were approximately 100,000 Azoreans in the United States. One would think that such a sizable immigrant population would warrant a substantial amount of original folk music being recorded! For example, there were only a few thousand Albanian-Americans in the United States at that time, and discs of Albanian music were issued on both major and independent labels. But, that was not the case with music of the Azores. Apart from a group named the Açoriano Quintette that recorded a handful of rare tracks in 1923 for Victor (and which I’ve not heard or seen), I believe that the only other early commercial recordings of Azorean folk music by Azorean musicians were made in Oakland, California, on a vaguely mysterious, independent label named after its proprietor: Anthony Sears. Their pressings were lousy – grainy and noisy, and sometimes with pressing defects such as dents. However, they are wonderfully rootsy, unpolished performances, likely made under non-professional conditions, and possibly recorded by family members and friends. Virtually no information exists on the web about these recordings. Who was Anthony Sears, and what was his story? Researching a man with a common name like “Anthony Sears” who was active in a large metropolis is not necessarily an easy task. But, we are given one major clue on the front of his record label: the business address, at 8423 E. 14th Street in Oakland. Unfortunately, the present day site of that address is now the Tassafaronga Recreation Center. In other words, it’s a baseball field. All traces of Sears’ place of business and the structures that held it are gone. Check that off of the list. Searching digitized newspapers by ProQuest and Newspaper Archive does not give us much to go on, either. The San Francisco Chronicle has been digitized only until 1922, and gave me one clue – a man named Anthony Sears of Alameda, California, was arrested for not paying child support in 1897. Same person? I didn’t think so. This Anthony Sears was a grown man in 1897 with multiple children, and likely not making recordings ca. the mid-1940s. Was he a relative? I moved on to the Newspaper Archive and got a hit on the address – by the 1950s, 8423 E. 14th Street was a bar called Gilbert’s. Nothing further, and nothing on Sears. Hm. In this day and age, it’s hard for some people to wrap their heads around the fact that most of the world’s information is still not online, and not digitized with optical character recognition software. Scholars and researchers know this – but many “digital natives” don’t. If you’re lucky, a newspaper might have a subject or name index. In the case of the San Francisco Chronicle, one does exist, but it only covers major topics. A tidbit about a man named Anthony Sears would never have been indexed by the Chronicle back then (though it might be kept in a clippings file). No, in order to properly research a person like Anthony Sears, you have to actually go to a city library with generous microfilm and microfiche holdings, sit down at a machine, and do real research. I mention this because sometimes people assume this stuff just appears out of thin air. Over the years, I have spent countless hours wrangling microfilm machines for various projects, straining to read out-of-focus articles in long-dead publications. While I didn’t find all that much on Sears or his life, and I wasn’t able to trek up to the Bay Area to pore over the microfilm of local Portuguese newspapers like the “Uniao Portuguesa” not available in Los Angeles (and where I would bet there might be some additional information), just by looking up early phone books, censuses, and my perennial favorite, the Polk City Directory, I was able to identify the Anthony Sears who was behind these recordings. First off, there were several people named Anthony Sears active in Oakland at that time. There was the Anthony Sears mentioned above, aka “Antone J. Sears,” “Tony J. Sears,” and simply “Tony Sears.” A waiter, barber, and insurance solicitor, he disappears from public records at about 1918. I realized he was not our man. Then there was Anthony Sears the mechanic and utility man, from Portugal, who lived with his wife Helen, and who first appears in public records at about 1940. He seemed like a possibility, but I couldn’t connect him with the address on the record. There was also Anthony Sears the porter, and Anthony E. Sears the “vulcanizer” – not them, either. The Anthony Sears who created these recordings was Anthony A. Sears, born in Portugal or a Portuguese territory on February 13, 1887. I have no idea precisely where he was born, nor do I have any idea what his exact connection to the Bay Area was, but Sears first appears in Alameda County in the 1920 census and in 1921 city directories, with his business address located directly next door to his future 78rpm business, at 8425 E. 14th. It’s no surprise that Sears’ home at that time was in nearby San Leandro – that city was the center for Portuguese immigrants in California. It turns out he, too, was a barber, and remained one for most of his life as far as I can tell, save for a brief period where he was partnered with a man named G. K. Porterfield, and their “Porterfield and Sears” real estate, insurance, and loan business that lasted a brief 2-3 years. Anthony’s wife was named Anna (sometimes “Annie”), and after living in San Leandro, they settled in a small house on 86th Avenue, in Oakland. Anthony soon dropped the real estate work and went back to working as a barber, now moving his shop one door down to 8427 E. 14th St.
Fifteen years later, in 1939, Anthony was by then a barber at the record label address, 8423 E. 14th St., and still living at the home on 86th Avenue. Their son Albert, now married to Dorothy (possibly young Dorothy Soares, their neighbor? ), was working as a mechanic, and lived with Anthony and Anna for a couple of years before moving out. One thing I could now confirm because of the address: these Azorean recordings were almost certainly made after 1939. Anthony and Anna had moved to a home on Edes Avenue by 1943. By 1949, there was no trace of Anthony in public records. It turns out he died in 1951. His only child Albert appears to have died at the young age of 40, in 1956. Anna Sears continued to live in the Edes Avenue house until at least 1954, but by 1957, she was gone, too. There is no record of an Anna or Annie Sears, with her particular date of birth, in California death records (though there is an intriguing close match). At any rate, we can almost certainly say that the barber Anthony Sears made these recordings at his place of business, sometime between 1939 and 1949. What connection did Sears have with that street and that block of addresses? Who were the other musicians? I have no idea. Despite not knowing much about Sears himself, it’s true that “Anthony Sears” was an interesting homespun label. Sears didn’t just issue Azorean discs (of which there were at least 16 discs issued). He mainly issued Portuguese music – at least 35 discs – especially fado performed by presumably local musicians, also backed by the “Sears Orchestra,” which sometimes consisted of just a fiddle and mandolin. Some of these are apparently syrupy, but some of the fado tracks have a real down home quality to them, too. The label itself says that they are “modinhas” – folk songs. This track, thankfully, is the opposite of syrupy. After a short verbal introduction, Sears and Co. launch into a terrific, fiddle-based dance tune with some of the greatest unhinged vocals I’ve heard in a while. The piece itself is a “chamarrita,” a type of folk dance, and is performed here in the style from the Azorean island of Faial, with its black sand beaches and the large Cabeço Gordo volcano in its center. An interesting wrinkle has appeared regarding the Anthony Sears saga. 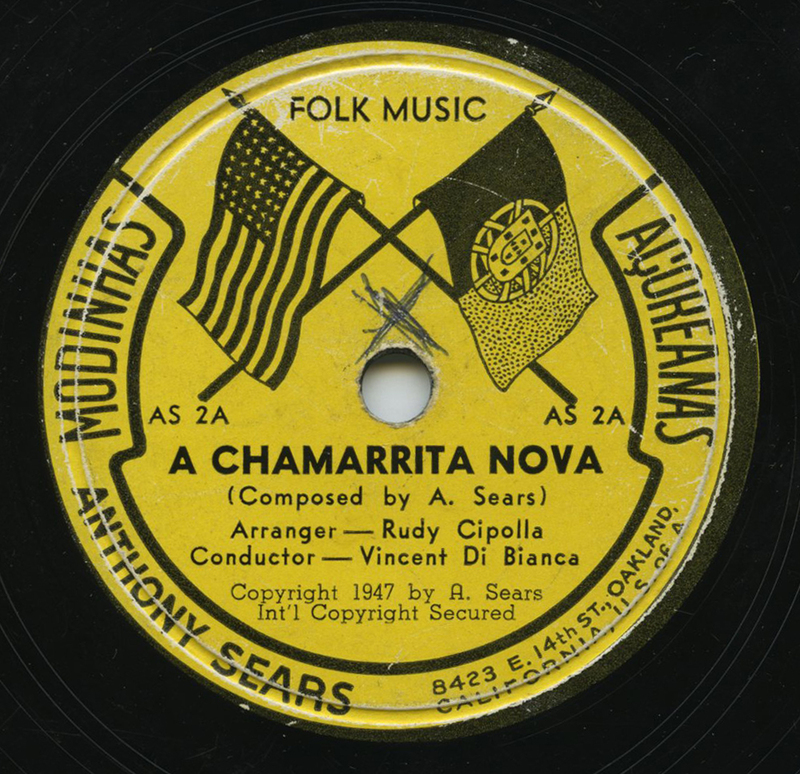 I discovered that Anthony Sears issued a second series of Azorean 78s on his label. For this series, it appears that he went with both professional musicians as well as a better pressing plant (the pressings on this series don’t have any pressing errors nor are they brittle, as the others are). The musician credited as the arranger of these tunes is none other than Rudy Cipolla, a well-known Bay Area mandolin player with a lengthy career, and who eventually recorded for Rounder Records. A Berkeley-based violinist named Vincent di Bianca is also credited as the conductor. Anthony A. Sears is credited as the composer for these tracks. Most importantly, there’s a date: 1947. It seems to me that these were recorded several years after Sears’ first session of Azorean music. My theory is that Sears perhaps felt that his earlier Azorean discs were a little too homespun, and wanted to give them an up-to-date, professional sheen, with the addition of Cipolla and di Bianca. Unfortunately, in my opinion, the life was sucked out of them. The wonderful kitchen-table feel of his first run of Azorean discs (featuring possibly his family and friends) is gone, and we’re left with something that sounds like “That’s Amore”-like tourist music. Nevertheless, Sears likely had sound business acumen – this was music that could sell copies. 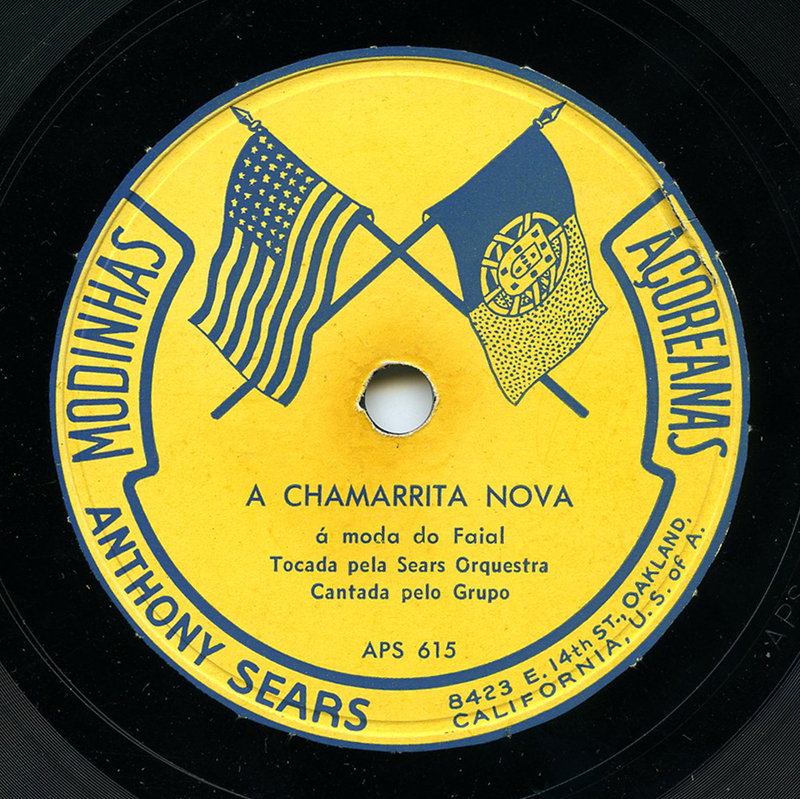 To me, however, the best of the Sears label – wonderful documents of local “Modinhas Açoreanas” by immigrants – was recorded by the still anonymous non-professionals that Sears assembled years earlier, playing in the the example provided here. Without overdoing it or descending into a lame speech, I just wanted to say a couple of things about the elephant in my room, the Grammy Awards, which took place last weekend here in Los Angeles. What the hell – it’s my website, I might as well put a word down on virtual paper. First, and perhaps most obvious, I was naturally happy that we were nominated. It’s the highest honor in the American music industry, for crying out loud – at some point, it doesn’t do anyone any good to be cynical. Second, I am really lucky that Opika Pende was even produced in this day and age much less considered for the award, especially with the relentless onslaught of reissues coming out each year, vying for consumers’ attention. I mean, it could have easily been bypassed in favor of the latest distended Pink Floyd archive release. (The Best Historical Album category allows any release that contains material older than a mere five years.) But it wasn’t bypassed. It was recognized. Like several of the other nominees, we had no corporate or philanthropic monolith’s money behind us. And frankly, like others who work hard at labors of love, I think we all deserved every bit of that nomination, and then some. It took 10 years to accumulate the recordings, 4 years to develop the project, a year to write the book and contact dozens of linguists, musicologists, native speakers, and scholars, 3 months of rapid, 7-day-a-week design work, and 3 months of detailed restoration and mastering. Good people put lots of exceptional work into this thing. All the while I was working my full time job, getting a Master’s at night and on weekends, and periodically traveling back and forth across the country for extended visits on Family and Medical Leave to help take care of my mother who was dying of cancer, watching as she, ravaged by chemotherapy, hung delicate and colorful homemade signs that said “Opika Pende” all over her home in a heartbreaking attempt to stave off the inevitable. And that’s not even the half of it, but at the risk of getting too self-involved, I’ll cap it off with that. Life’s hard, we all know it, and projects like this one take untold hours. No matter we didn’t win – it was a long shot. The project was finished, released, and thankfully, deservedly, recognized. If you purchased and enjoyed the set, I really am happy about that. If you haven’t, there’s something special waiting for you. And if there’s any justice, there are many others who have devoted their lives to releasing some of the most influential early recordings on earth who have never been nominated and should be. (Richard Nevins of Yazoo Records, anyone? Talk about a lifetime achievement award.) So…onward! Hey Jon, I am especially thrilled because I am a quarter Azorean from my father’s father’s side….the family name was Pereira before it was Perry. Good music, and as always, thanks for what you do. Fantastic, Vic, and I appreciate the kind words. Was there a New England connection, at all? I grew up among families with names like Pereira, Lopes, Borges, etc. etc. They all ended up in Northern California near Auburn. There’s a pretty big Portuguese community out there. Meanwhile….I’m just a little freaked out to suddenly find out that both Steve Perry and Katy Perry apparently arrived at their “Perry” surnames the same way as me. I AM POP MUSIC ROYALTY!!! Ha! I guess you are! The “Chamarrita Do Meio” on the APS 617/618 record I have is “a moda do Pico”- in the style of Faial’s neighboring island, Pico. The fado on the other side sounds more rough than anything I’ve heard from Lisboa or Coimbra. Each one of these Azorean discs are usually a type of “fado” coupled with a folk dance (chamarrita, or something else). Thank you for all that you do, Jonathan. The world is much better off with people like you around. I was very glad to see Opika Pende nominated. I’m very sorry to hear about your mother. Thanks! That’s very nice of you to say. They also took over from Heritage distribution of their Fado collection from 78s. Keep up the great work + condolences; losing a mother is not easy. Thanks John – I appreciate that. Wow, great music & fascinating research into the label. And both congratulations & condolences, as well. Thanks, Matt – yes, life goes on…(or at least that’s what we’re supposed to say). Well, Jonathan. You’re right to be proud. Of all the anthologies I’ve come across “Opika pende” takes the cake. All 100 pieces of music are masterpieces in their own right and to accumalate such variety on one collection is a tremendous delight. hey jon, opika pende’s making of reminds me of mr james michener’s essay ” when does education stop”. it states the preparation for “hawaii” which makes it an even more great read! thank you for your efforts and for sharing whatever you squeeze out of those very bits of information. it makes it an even more profound listen! Jon this is very enjoyable – in spite of your warning comments about the sound I found it truly lively and “hi-fi” in its communicative vitality – it seems that even if the disc material and pressing weren’t optimal the actual capture of the sound was pretty good, and the music is so straightforward and “natural” that all in all it’s a lovely piece of work both by the Sears Orchestra and by your good self and the tools of your art! Not to speak of the rarity of music from this culture…. Thanks for sharing your thoughts with this post. I’m touched by what you said about your mother and amazed at the labor of love you created with your project. What an amazing post–the research is admirable and well-done. I’m a quarter Azorean (maternal grandmother), so it was fascinating from a personal angle, too. Opika Pende is a gorgeous, wonderful piece of work that deserved the recognition (and to win as well). You do great work. My condolences for the loss of your mother. Thank you, Joe – I appreciate your words. This article is amazing…hats off to you! I recently discovered from a cousin who invested time in researching our family tree that our great grandfather was a musician. He came from Cape Verde to record at Columbia in New York City. After researching myself, I came across this article. His name was Augustus Abreu. Thank you for keeping his name alive! Heatha, the pleasure is all mine. Your great-grandfather was a terrific musician and his work should continue to be recognized. I’m so glad you found the site! My name is josé Gomes, i’m a highschool teacher living in Pico island (Azores) and i would like to use the image of this record for an university paper. Is it possible?